M Victoria Street is the second London restaurant venture from Martin Williams, following the success and wide acclaim of M Threadneedle Street in 2014. M Victoria Street is a 9,000 square foot part leisure, part retail venue that has several distinct offerings set over three floors. These include the Grill Dining Room, Raw Bar, both public and private members bars, private dining, event spaces and a wine tasting room, all under one roof. This new interior design features a unique, mind-blowing curvacious brick ceiling, entirely handmade and taking its inspiration from the interiors of traditional Italian pizza ovens. Chotte Matte is located in an imposing 60ʼs building at the north end of Frith St. The internal dining space is 450sqm, including in this is approximately 100sqm bar area with some external dining along the Frith St frontage. Access to the restaurant is via a formal entrance off Frith St, entering a Reception Lobby where one can either enter the Bar and Sushi Bar or reach the first floor restaurant via aspiral stair. Dock Kitchen is part of the newly redeveloped Portobello Dock complex, which is rapidly evolving into West London’s most innovative hub for design and food lovers. 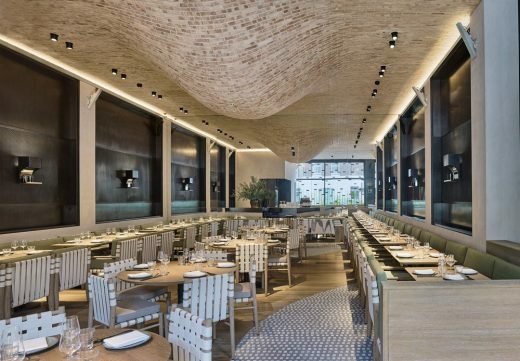 Set within a stunning interior designed by Macaulay Sinclair, Inamo St. James is an innovative oriental fusion restaurant & bar coupling cutting edge technology with exceptional cuisine.